Scarecrow: Professor Jonathan Crane is a brilliant psychologist and chemist with a keen hand in the realm of phobias. Terror is his ally as his infamously concocted fear gas causes his victims to hallucinate their deepest darkest fears. Why He Wins: As Crane awkwardly walks toward his fishbowl-headed foe, his senses are assaulted by a milieu of strobing lights, hallucinated creatures, and other manner of childish movie magic. The Scarecrow trudges on, unaffected, unwittingly deriving a warped bravery from his absolute lack of fear for anything except some dark knight. Once within range, he releases his fear gas into the mists around Mysterio. 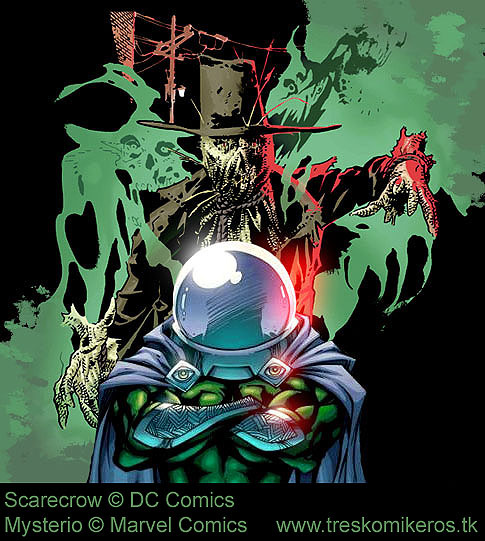 With both men now surrounded by a cocktail of their own hallucinogenic gases, Scarecrow emerges victorious due to his resistance to the chemicals, while Mysterio trembles in shock as his air supply runs out and he’s forced to breath in the terror. Mysterio: A former movie effects specialist, Quentin Beck saw a brighter future in the world of crime. Using his expertise in film magic and gadgetry, Beck made a name for himself as Mysterio, the master of illlusion. Why He Wins: After using a robot impostor to act like it’s affected by the hallucinogen, Mysterio masterfully hides in his control room and watches Scarecrow stab the robot in the heart, fake blood splattering everywhere. The Master of Illusion then shows his own hand while enjoying the foolish premature celebration of the so-called psychologist of fear. Numerous robotic crows then pop out of the shadows and attack with an array of claws, lasers, and hi-tech weaponry. Machines don’t breath, and Jonathan Crane is only human as well. Scarecrow is only able to dodge so much before falling prey to trickery. In the end, the Scarecrow is only for the birds.